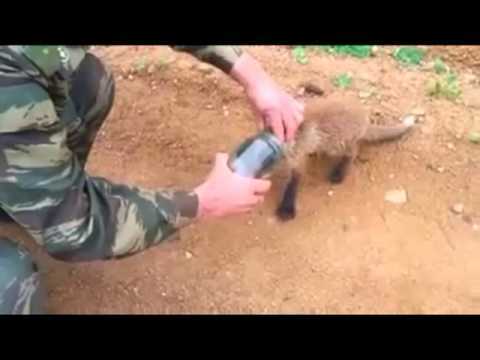 This baby fox cub got himself into trouble and had no idea what to do. Wild foxes tend to run away from any human but this little cub knew that he had to do something before he died. The small fox got his head stuck in a jar and noticed a trucker going by, the trucker noticed the animal begging for help. Luckily the man was not scared of animals and quickly jumped into action and helped the poor cub, which stood there and cooperated.